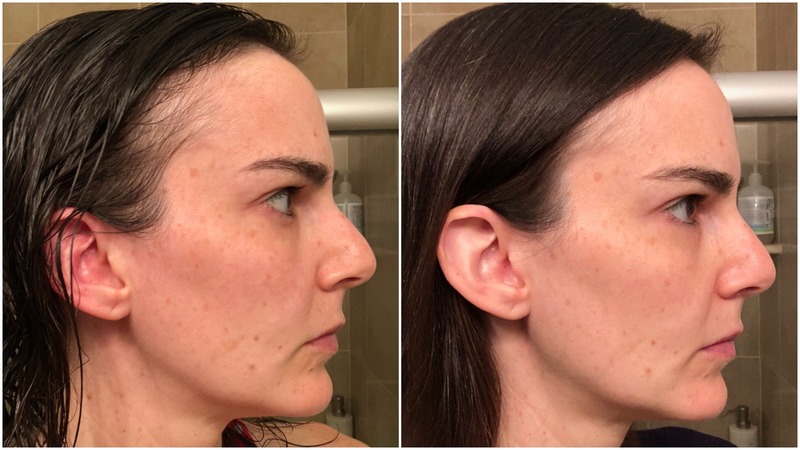 It’s time to do a six-week check-in on my skin care experiment! In early October I began using two products from Osmosis Skincare twice daily on my major dark spots to see if I could get them to fade. If you haven’t read the initial post about my experiment, click here to check it out. I’ve been really good about using both the Enlighten Pigment-Fading Serum and Rescue Epidermal Repair Serum twice a day. I’m not always consistent with skin care products beyond cleanser, eye cream, and moisturizer (plus SPF in the morning, of course). Sometimes I’ll tone, sometimes I’ll mask, sometimes I’ll exfoliate, sometimes I’ll do all of the above. But I’ve managed to actually use both Osmosis products in the AM and PM for six weeks straight! My process: after cleansing and sometimes toning I apply the Rescue serum, then I apply Enlighten, and then I continue with the rest of my routine. I’m using these two products as spot treatments only and I’m not using them on my neck. I’m focusing on the spots lining the tops of my cheekbones, the couple spots on the right side of my forehead, a large spot on my left cheek, and a splotch on my lower right cheek. While I’m not seeing dramatic results (which I didn’t expect), I do think I’m seeing slight fading on some of my dark spots. The spots on the right side of my face seem to have faded just a tad, while the ones on the left side of my face don’t appear to have faded. Let’s take a look at some comparison photos of my bare face! 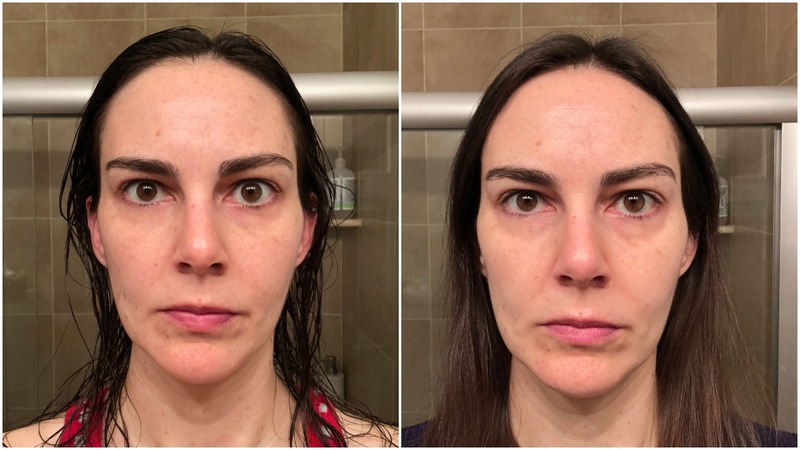 I took my 6-week photos in the same conditions in which I took my before photos: in the bathroom with the door closed, to control for any changes in light from windows. 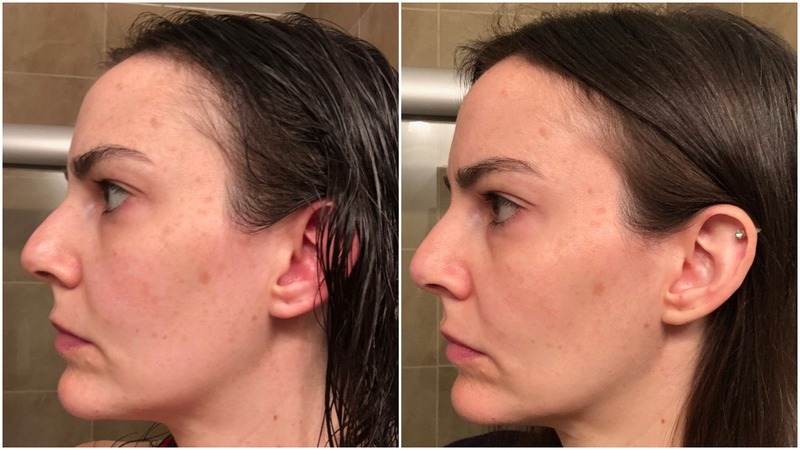 However, I did make the mistake of taking my before photos after getting out of the shower, and you can see that my skin is redder in those photos. But I’m wearing nothing on my face in any of the pics. And here’s the right side, which is where I feel I can see the most fading (though it’s still VERY subtle). The larger splotch above my right jawline is probably the spot that has most visibly faded. I am most definitely going to continue using Enlighten and Rescue on my dark spots twice daily. Because I think I’m seeing a bit of fading, I want to keep at it and see if my spots might just need more time with these treatments. As I’ve mentioned, I’ve tried many dark spot fading products before and nothing has been effective, so I think my spots are particularly stubborn. And then there’s the issue of consistency, which I have been bad about in the past. Now that I’m in the habit of using both products two times a day, it’s easy for me to maintain the routine. I’ll post another update on my skin care experiment, probably in another four to six weeks, and we’ll how my spots look then!